Tin Lunch Boxes HQ | Great Nostalgic & Retro Designed Metal Lunch Boxes! 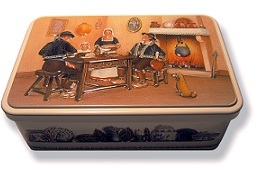 The Best Selling Tin Lunch Box Of All Time – 9 Million Units Sold! In a previous post I talked about the Aladdin Company’s success in the early 1950s with the Hopalong Cassidy Lunch Box. If you haven’t read that post, then it is enough to know for now that this product provided an enormous boost to Aladdin’s sales which shot up from 50,000 units per year to 600,000 after Hopalong was launched. Hot on the heals of this, the American Thermos Company had tremendous success with their Roy Rogers lunch box which sold over 2.5 million in 1953 alone. Expensive at the time, they were originally priced at $2.69 by Universal. In the years that followed sales would eventually top 9 million boxes! 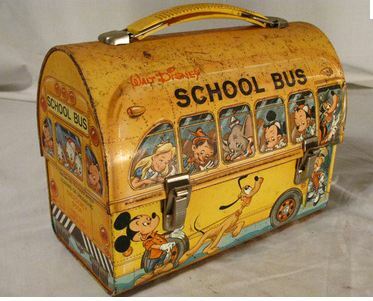 As merchandise goes this product had everything: A attractive dome shaped design, the iconic American school bus and a host of Disney characters including Pluto, Jimmy Cricket, Goofy, Thumper, Dopey, Bambi, Donald Duck and of course Mickey Mouse! Not only that but it had huge everyday practical value at a time when tin lunch boxes were standard issue for an increasing amount of school kids. 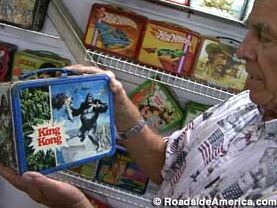 It is a testament to the popularity of lunch box collecting that the United States is home to several lunch box museums. Generally speaking they have a fairly low profile and so I thought I’d mention three of them here at Tin Lunch Boxes HQ so you know to call in next time you are passing by! This wonderful collection of over 700 boxes is Debbie Clarke’s creation. Debbie is a retired teacher and her website has several fantastic photos of parts of her collection as well as the museum building itself. Although the site is perhaps a little thin on detail she is also an active trader on eBay where there is some more information about her life and how she got started. You can find that here. As for the museum itself, it is located at 3674 E Hwy 20, Nice, California, Lake County. 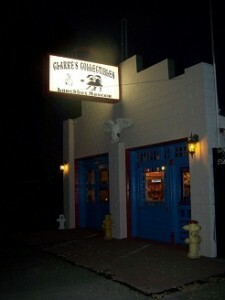 The building was the old Nice firehouse and was transformed by Debbie and her husband Duane. Please note that it open for private tours only which can be arranged directly with Debbie by calling 707-274-9952. Last but certainly not least is Allen Woodall’s Lunchbox Museum in Columbus, Georgia. Whilst in no way diminishing the fabulous achievements of Debbie and LaDora it has to be said that Allen’s collection is simply massive! So big in fact that it holds the record for the largest collection in the world! The museum is situated above a country-music radio station inside the International Marketplace, 318 10th Ave. Columbus, GA. 31901. This is probably the ultimate destination for us lunch box enthusiasts, partly because of the sheer size of the collection but also because Allen Woodall himself is considered a major authority on metal lunch boxes having authored one of the few books available on the topic. I’m sure there are more museums around the world and potential new ones from private collections which could be opened up to the public. I’d particularly be interested in any collections that are located outside of the US. This would be especially interesting because tin lunch boxes themselves are intrinsically American. If anyone knows further information on this, please do leave a comment! I mentioned before how one of the earliest tin lunch boxes was created in 1935 by Geuder, Paeschke and Frey and featured an image of Mickey Mouse. This was, in effect, one of the earliest meetings between utility, popular culture and technology. The utility was the fact that you could carry your food around in it; the popular culture was Mickey himself and the technology was the technical process of lithography. The trend of applying popular images to lunch boxes using this technique didn’t really enter its prime until 1950 when the Nashville-based company Aladdin employed a top class industrial designer to create what became the famous Hopalong Cassidy lunch box. Priced at a (very reasonable!) $2.39, Aladdin sold over 600,000 units during the first 12 months after the launch of the product. This was a massive boost for the company which had previously seen sales of only 50,000 per year. 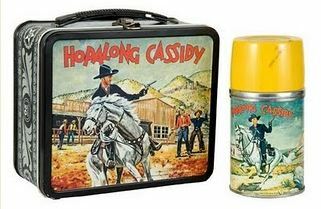 Production of the Hopalong Cassidy lunchbox continued for a number of years and today they have become collectors items fetching anything up to $1,000. If you search around the web on sites such as eBay you’ll find a few for sale. For some reason the majority seem to be from 1954. I’ve no idea why this is but if you know I’d really appreciate if you’d post in the comments section below and enlighten me! During this time and the following decades the metal lithography process itself gained immense popularity not only in the manufacture of metal lunch boxes but also in other fields of contemporary culture and the marketing of consumer products. Canned foods featured many different designs and metal picnic baskets were printed with images of woven basket reeds or plaid textiles. These designs even got copied by artists and in 1962 American artist Andy Warhol used a semi-mechanized silkscreen process on canvas to produce his famous “Campbell’s Soup Cans”. Whilst lithography has been used extensively by artists during the 20th century, for commercial manufacturers it was merely a technique used to increase the popularity of their goods – and therefore their sales – by imprinting already well known TV and movie characters onto their products. In this article I originally intended to go into more of the history of lithography and the actual technology behind it. However, after some initial research I decided it was better not to venture there and simply point those of you who are interested in the direction of Wikipedia which has an excellent and extensive article on the subject. On my hunt around the “interweb” I just came across this excellent article. Amongst other things it features an excellent interview with Stacey McCaffrey who owns Etsy.com store Vintage Jane. Interesting to see that she suggests that the reason lunch boxes are so collectible is nostalgia. Well I have to say Stacy, I couldn’t agree more! Please do read the interview – it is well worth 3 minutes of your time! Here is a link. 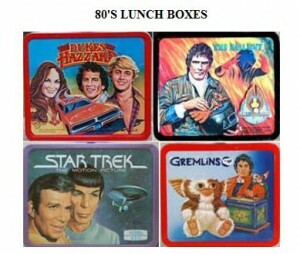 I just found this site which features a number of (eBay listed) metal lunch boxes from the 1980s. Ok, so there are some plastic boxes in there too but still a pretty impressive list don’t you think? Star Trek, Gremlins and my all time favorite The Dukes of Hazzard which is listed for the tidy sum of $135. One lunchbox that I am really after is unfortunately not listed here. It is the Airwolf lunchbox. Out of the Knight Rider, Street Hawk and Airwolf series I much preferred the latter. Overall, I think the jury is out on the 1980s as to whether it will become a classic and collectable decade. On the upside there are a lot of people with some real vintage memories of TV shows etc but on the downside there was an awful lot of memorabilia manufactured. I think we will have to wait until “supply” reduces as more boxes inevitably get lost and destroyed before prices will increase. Of course, this is one of the reasons why the tin lunch boxes of the 30s and 40s fetch such high prices at auctions: Supply was severely restricted due to the economic conditions during the Great Depression and the Second World War. Tin Lunch Boxes – American was Built on Them! Tin lunch boxes first emerged over 100 years ago during the mid-19th century (David Shayt, National Museum of American History). Originally woven from straw, manufacturers later favored tin as the material of choice due to its robust and durable nature. An important development in the early 20th century was the use of tobacco tins to haul meats. This, coupled with the subsequent invention of lithographed images on metal gave rise to the huge popularity of the many weird and wonderful tin lunch box designs which became incredibly popular with young people. 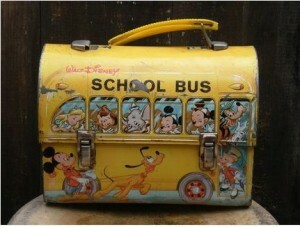 By the mid-1930s the first licensed character lunch box appeared on the market. Created by Geuder, Paeschke and Frey it featured a sliding tray, a handle and an iconic lithographed design of Mickey Mouse. In retrospect, the period that followed this really can be regarded as the heyday for the tin lunch box. In fact everything was going swimmingly until the early 1970s when safety concerns (of all things!) contributed to its demise. Parents had become concerned that metal lunch boxes (by this time stainless steel lunch boxes rather than tin were the most popular) could be used as a weapon by children in the playground. Such was the ferocity of the protest that the Florida State Legislature eventually passed legislation on the issue with other states soon following suit. Although there are undeniable benefits of contemporary plastic and vinyl designs (watertight, airtight and durable), if you’re anything like me the tin lunch box will always be your favorite! It gives me comfort to know that others share my feelings: Many of the early lithographed designs, especially from the 50s and 60s, have become surprisingly collectable. For example, a mint Isolina lunch box sold for $11,500 in 2003 at Chickens Go Moo, Inc auctions! Always a sucker for nostalgia my all-time preference is actually for retro-looking shiny metal lunch boxes which were used so much by the American workforce during the early and mid-20th century. This is the design which I use 5 days a week at work. American was literally built on the tin lunch box! I hope you enjoy this site and share my enthusiasm for a small but in my view important part of our history. I aim to continue building this resource over time and if you have any questions or comments I’d love to hear from you so please don’t hesitate to get in touch. I will reply to all messages.